Cleveland State Community College has an obligation for the safety of students, faculty, and staff during times of severe weather conditions. The decision to close the college will affect hundreds of people. It is imperative that the decision is made in a timely fashion to ensure the safety of students and employees. With that end in mind, the following procedures are in place to facilitate the decision making process and the communication of any changes to the college’s class/operating schedule during inclement weather situations. If the weather begins to deteriorate during the late evening or early morning hours, the Campus Police Department will take the lead in gathering information from local authorities and assessing the conditions of the campus, and will communicate pertinent information to the Vice President for Student Services. The Vice President will provide information to the President and other Senior Administrators. The President of the college will make the decision to close the college, delay opening, or to operate a regular schedule. Once a decision is made to delay opening or to close the college, the Director of Communications will be contacted to begin the process of informing the media of the decision. If weather conditions deteriorate at some point after the college is in session a decision will be made to close no later than 3:00 p.m. in order to have ample time to notify students for evening classes. In general, when decisions about school closings are made, one decision will be made for all Cleveland State locations/centers. In the event that one center experiences extreme weather that the other centers do not, a decision to close or delay opening of that center will be made in consultation with the appropriate administrator for the off-campus Center(s). On those occasions, an announcement about the one closing will be made on local radio and TV stations. Announcements will also be posted on the CSCC web site and RAVE alert messages (voice, email, and text) will be sent. The Director(s) for the Athens and Monroe County Centers will have the incoming message changed on the phone system at the respective Center(s). Decisions about closings are made as early as possible to ensure that students, staff and faculty are informed. The communications department will follow its inclement weather communications plan in all situations to alert students, employees, and the general public of any changes in class or operating schedules due to inclement weather. Information will be listed on area TV/radio stations, posted on the CSCC Web site, sent by RAVE message (voice, email, and text), and a recorded message will be posted on the CSCC main information number (423.472.7141). Cleveland State will only announce schedule changes. If there is no announcement, then classes and campuses are on their regular schedule. The Communications Department will notify the TBR Chancellor’s Office of any weather or other emergency-related closings. The same processes listed above will be followed when conditions warrant consideration of altering the class/operating schedule over a weekend. In the event of closure of the college, outside groups that may have contracted for use of college facilities on any Cleveland State campus will not be permitted to use the facilities. The Facilities Coordinator will contact those groups that may have contracted for use of college facilities on the main Cleveland State campus to notify them of any changes to the college’s operating schedule. The Director(s) for the Athens and Monroe County Centers will contact schools or other groups who have contracted for use of facilities at the off-campus Centers to notify them of any changes to the college’s operating schedule. 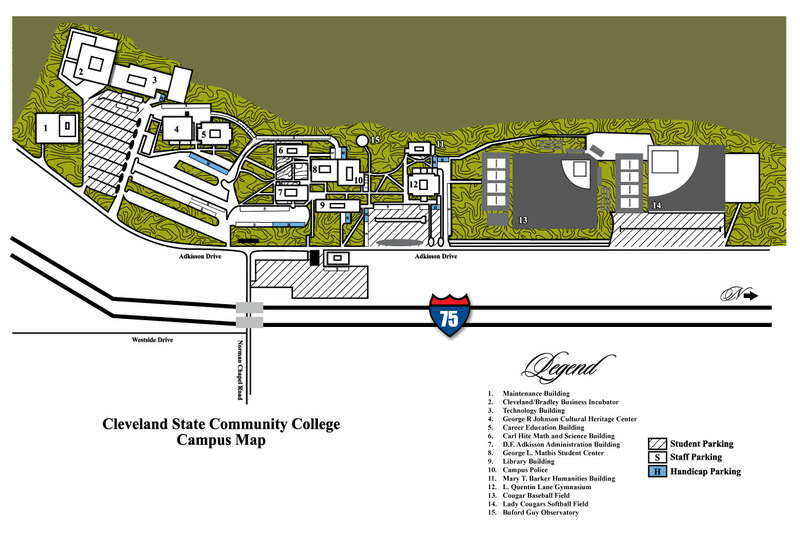 In the event of closure of the college, outside groups that are regular tenants of college facilities on any Cleveland State campus may be permitted to use the facilities. The Director of Communications will contact those tenants on the main Cleveland State to notify them of any changes to the college’s operating schedule. The Director(s) for the Athens and Monroe County Centers will contact regular tenants of the off-campus Centers to notify them of any changes to the college’s operating schedule. Instructors of classes that do not meet or start late due to inclement weather will announce arrangements for making up work as soon as the class resumes. Regular full-time and part-time employees on the active payroll who are scheduled to work during the declared times of closing will be granted time off from work with pay. Employees who are not scheduled to work will not be paid for the time the college is closed due to inclement weather. Employees who were previously approved for leave for the duration of the inclement weather closing will be considered not scheduled to work and will be charged the appropriate leave. Employees who were previously approved for leave for a portion of the time during which the college is closed will be considered not scheduled to work for the portion of the time that was approved as leave. The employee will be considered scheduled to work for the remainder of the closing. If an emergency closing has not been declared due to inclement weather and an employee is prevented from reporting to work for his/her normally scheduled working hours, annual leave or leave without pay will be charged; or, the employee may be allowed with institutional approval to make up the time lost. Regular part-time employees will be affected on a pro rata basis in each of the provisions listed above.